The Wilmington Grill Music Stage and beer garden is a great place to catch tunes day and night. Entry is FREE. Beverages (Beer, sodas, and water) will be available for purchase and outdoor games on site. Listen to your favorite local and regional musicians playing a variety of rock, blues, and folk. WIN A GRILL LIKE THIS! 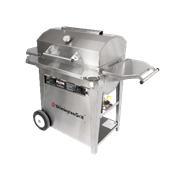 Wilmington Grill will be doing a raffle all weekend on one of their Cape Fear Deluxe Grills (approximate value of $2,287.00). Swing by their tent at the Street Fair Music Stage Presented by Wilmington Grill to enter. Winner will be announced Sunday and need not be present to win.